Fittingly for Halloween we kick off this column with a look at Fenerbahçe's visit to Bursaspor. Fitting because Bursaspor are Fener's favourite worst nightmare. This doesn't stem from last seasons double over the Istanbul giants, but moreover because of the events on the final day of last season. This is a story that needs telling. It was a sultry spring evening in Istanbul - at the Sukru Saracoglu Stadium - and Fenerbahçe were leading the Turkish Super League. Their opponents were Trabzonspor. At the same time, second placed Bursaspor were playing against Besiktas at home. And, just a single point divided the two teams. It was widely expected that Fenerbahce would cruise home and clinch the title. Special T-shirts for that day had already been prepared. But it didn't happen. Fenerbahce could only draw with Trabzonspor. 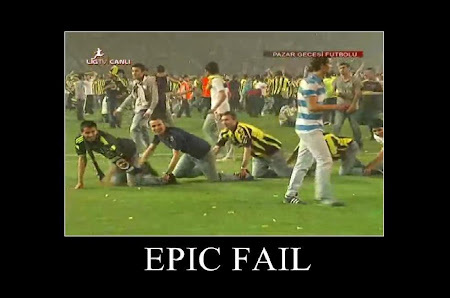 And this is where it gets interesting; Fenerbahce fans thought they'd won the title and began celebrating on the pitch. They even started doing the crocodile walk. Ah, the crocodile walk, more of that later. They celebrated because they'd heard the score in the Bursa match was 2-2. Actually It wasn't. Bursaspor had beaten Besiktas 2-1 and they were the real champions. Match tickets start from around 50 Turkish Lira (£20). In true Turkish tradition, fans arrive hours early. Best seats in the house - tick. It was an historical night for Turkish football because Bursa had ended the dominance of the big four teams in the league. Meanwhile, back in Istanbul, Fenerbahce fans soon realised that the scoreline from Bursa had been misreported - it was an hoax. So why did they think it had ended 2-2 at the Bursa Ataturk Stadium? Well, the guy on the Fener PA system had announced it so with his mic. As such - amid wild celebrations - the Fener players stopped attacking Trabzonspor in last few minutes. Happiness then turned to misery as news spread out via mobile phones as to what had really happened. Fenerbahce fans burned some seats, threw bottles at the police, and Trabzonspor and Fenerbahce players escaped from the stadium in police cars and ambulances. After that traumatic night, this Bursaspor-Fenerbahce match was always going to have a real edge. Before the game everyone expected insults from the Bursa fans mocking that fake 2-2 score. And they didn't disappoint. Before the game they chanted "Husband of Fenerbahce is coming" And they opened a huge Banner with a picture of celebrating Fenerbahce fans from last year declaring "We said everyone will make a crocodile walk". So, just what is the crocodile walk? Well, it's a traditional goal celebration in Bursaspor. It was introduced to Bursa by Ugandan player Majid Mususi in the middle of 90's. And they called it Timsah Yürüyüşü (Crocodile Walk). I Don't know how to describe it but you can just take look at he picture. After that celebration, Bursaspor's nickname became "Yeşil Timsahlar" (Green Crocodiles). The famous Bursa crocodile walk lead by Majid Mususi. Erm, lads. Ahem, you've not actually won the league. This is going to look rather silly in the morning. Translation: "Didn't we say everyone will do the crocodile walk one day?". So, to the Game. Fenerbahçe dominated the first half and opened the scoring through Semih Sentürk. In the second half Bursaspor raised their game and Serbian Midfielder Ivan Ergic equalised. A draw pleased both sides, and in truth, it produced the best football of this season. Both teams fought for the win with passion. It was great to watch. Bursaspor battered the Fener goal in the closing stages, and Sercan Yildirim in particular was outstanding. I've heard you like to think of your bellies over there at EFW right? (cheeky scamp - Ed.) So what to eat in Bursa? There isn't too much around stadium aside from the famous doner kebab. Sunflower seeds are also popular amongst fans, but not to those who have to clean up the stadium. However, just a twenty minutes walk from stadium you can find one of the best meals in Turkey. 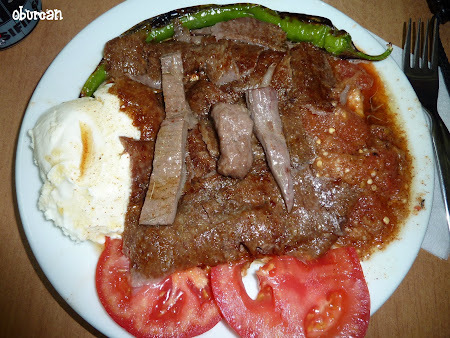 It's called the Iskender and consists of a doner on a plate with a special sauce and yogurt. It's impossible to eat more that one and you must try it. It's worth the journey alone. A good point well made. The Fenerbahce fans penned into their section with some rather over the top netting. The Iskender. Don't return from Bursa without trying it. Follow European Football Weekends and our new Turkish correspondent Ulas Gürsat on Twitter. That kebab looks .. AMAZING! Great work on this, look forward to reading more. The crocodile walk, brilliant! I remember my team Roda JC celebrating in a similar fashion in the 1994/95 season when we ended up runners-up in the Dutch league. It was called the 'Roda-rups', or 'Roda Caterpillar' in English. I was lucky enough to go to watch Fenerbahce v Bursa earlier in the 2009/10 season at the Sücrü Saracoglu.